The darkness that resides in the human heart has always been Dennis Lehane’s specialty, but since he abandoned the Patrick Kenzie/Angela Gennaro series, Lehane’s work has become darker and darker. Lehane is at his darkest in his recently published short story collection entitled Coronado. All but one of the stories centers on an act of violence, which Lehane then attempts to understand in terms of psychology, environment, upbringing, poverty, honor, revenge, and any number of possible underlying causes. At the root of each violent act is love—rejected, twisted, broken, or new. Most impressive in this collection is the final short story “Until Gwen,” which Lehane transformed into the play “Coronado.” He wrote the play for his brother Gerry, who is an actor in Greenwich Village. Witnessing the expansion of the short story into a play allows a glimpse into Lehane’s thought process as a writer. The back-story plays itself out in a way that the reader just nods, understanding how the characters came to inhabit their world. Interestingly, Lehane claims that the villain he wrote for his brother to play, known simply as Bobby’s Father, is the “meanest, nastiest, most unconscionable monster” he could imagine. Bobby’s Father is a sociopath ready to kill his own son for a huge pay off, but I still think his darkest character is still the monster in his second book, Darkness Take My Hand. I'm not sure how he does it, but Dennis Lehane makes the most unpalatable, unredeemable characters fascinating. 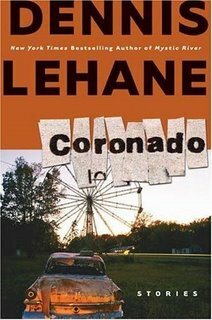 Coronado continues Lehane's meteoric rise in the world of modern fiction.